John “The Natural” Alessio, an Xtreme Couture fighter, is set to return to the UFC after more than a five-year absense from the world’s largest MMA promotion. Alessio will replace injured Matt Wiman against Mark Bocek on the main card of UFC 145 in Atlanta April 21. The event will be headlined by a light-heavyweight title fight between Jon Jones and Rashad Evans. 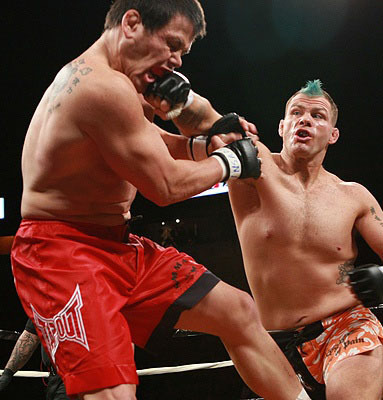 A 14-year MMA veteran, Alessio has only made three UFC appearances over the course of his career. At UFC 26 on June 9, 2000, he lost via submission to then-welterweight champion Pat Miletich. Alessio wouldn’t return until almost six years later, when he dropped a close unanimous decision to Diego Sanchez at UFC 60. His last octagon appearance saw him lose a unanimous decision to Thiago Alves at UFC The Final Chapter on Oct. 10, 2006. Alessio is currently riding a three-fight win streak and has been victorious in ten of his last 11 bouts. Visit http://www.superiorcagecombat.com for more info and tickets. Xtreme Couture Fighter John Alessio has put together a four fight win streak with 2 of them taking place within the month of March. With his win at Ring of Fire last week, former UFC welterweight John Alessio is back in the gym here at Xtreme Couture MMA and has indeed put himself on the right path following his decision to make major life changes. No longer part of the Las Vegas party scene and now a dedicated gym rat, Alessio has won three fights in a row and continues to look increasingly more impressive each time out. “The plan was to go in there and take care of business as fast as possible; especially with another fight being two weeks later,” Alessio told MMAWeekly.com of his Ring of Fire win. “I wanted to go in and not get any bruises, cuts or injuries, and I was able to do just that. After defeating Matt Delanoit at Ring of Fire, Alessio has little time to celebrate as he replaces an injured Carlos Newton at the March 20 W-1: Bad Blood show against Chris Clements. “I’ve got to totally shift gears now and completely refocus on a new opponent, a new style,” commented Alessio. “This guy is a stocky slugger and is really going to try to take my head off. Rather than be concerned about the short turn-around between fights, Alessio is excited to get a chance to replace Newton and keep his own personal ball rolling. “I love Carlos Newton, so it was a great honor to step into his big shoes and I hope I can fill them for the crowd,” exclaimed Alessio. “I just want to continue on the path I’m on right now. As Alessio mentioned, with his current success he hopes to open the eyes of the promotion that has cut him twice previously. “If I can pick up this fight with a win, that will be four in a row,” said Alessio. “With finishes in all my fights – two of them in the first round – I think I’m on the right path to opening the UFC’s eyes again. With petitions on Facebook by fans to have Alessio return to the UFC and his rejuvenated attitude, it may not be long before he finds himself where he wants to be. “Thanks to my friends, family and my sponsors: Knockout Fight Wear, TapouT, Gamma-O, Shaw Chiropractic, Full Tilt Poker, and TCB Fight Wear,” he closed out. “All the fans that supported me for this last fight, you were awesome. This Saturday (Dec. 13th) at The Pearl in Las Vegas, NV. Junie Browning will go into battle under the Xtreme Couture banner as he faces fellow Team Mir cast member Dave Kaplan on the main card. When Junie first joined the team here at Xtreme Couture none of us were sure exactly what to expect. Watching Junie on The Ultimate Fighter reality show potrayed him as violent and unpredictable, yet since the first day he stepped into our gym he has shown nothing but respect and conducted himself in a way that makes us all proud to have him as a member of our team. Junie shows the raw talent and work ethic that rests at the center of all Xtreme Couture fighters. Junie will have the support of his entire team and everyone here at Xtreme Couture when he enters the cage on Saturday night. Xtreme Couture fighter John “The Natural” Alessio (24 – 11) will be squaring off with Paul “Semtex” Daley (18 – 7 – 2) tonite at MFC 19 in Alberta, Canada. The event can be seen live on HDNet at 10:00 PM EST (Check your local listing). John Alessio is going into this fight after back to back wins over Pete Spratt and Gideon Ray where he was able to show both his submission skills and his abilities as a striker. Canadian born Alessio sets out tonite to make his homecoming a very painful night for the UK striker Paul Daley, who is coming off a submission loss to Jake Shields at EliteXC – Heat. MMA fans got to see a great card put together in part by Skip Kelp (Superfights MMA) and Kim Couture (KC Concepts). Xtreme Couture fighters took seven out of eight fights in a Night Of Combat II that left the fans wanting more! The Co-Main event featuring Rick Roufus (4-3), a six-time world kickboxing champion and UFC veteran Hector Ramirez (7-3-1) was a fifteen minute battle which both fighters left it all in the ring. Ramirez won the fight via unanimous decision but Roufus landed several impressive strikes in the first round, including a spinning backfist that staggered the “Sick Dog”. All three judges scored the fight 29-28. Ramirez added another win to his resume. In the co-feature, Jay Hieron (16-4) won a bloody unanimous decision over Chris Kennedy (6-6). Hieron went to work with a devastating ground and pound game letting Kennedy know immediately that Jay’s elbows should be called weapons of mass destruction which left Kennedy bloody and a fist size welt on his forehead in the second which only got worse. All three judges scored the fight 30-27. Kennedy, a local Las Vegas fighter, stepped up on short notice after Bryson Kamaka, who had been scheduled to fight Hieron, tested positive for marijuana during pre-fight testing by the Nevada State Athletic Commission. Mike Pyle (17-5-1) won via submission over Brian Gassaway (28-18-2). Pyle used a ground and pound attack before finishing with an armbar at 4:21 of the first round. Gideon Ray (15-10-1) completely helpless against John Alessio’s (24-11) heavy hands. Alessio knocked out Gideon in just 45 seconds into the first round and a bit of payback for some heated words at wiegh-ins which prompted Gideon’s cheap shot shoving tactic. Gideon continued to show little class when exiting the ring with an ice pack on his forehead, Ray threatened some of Alessio’s supporters sing ringside and was held back by his camp. Chalk one one up for the good guys! Josh Haynes (11-10) beat Sean Salmon (15-5), at 2:49 of the second round with an achilles lock. Haynes dropped Salmon with a heavy left hook early in the first. In the second, Haynes again dropped Salmon with a straight right. Salmon with a solid chin held on for second time and got up to continue the fight. When the fight went tot he ground Haynes not known for his ground game took complete control and ended the fight with a submission. -Ryan Hass defeats Ian Omalza by submission (Armbar) at 3:09 of R1. -Elena Reid defeats Stephanie Palmer by TKO (Punch) at 0:53 of R1. -Patrick “Kui” Gonsalves defeats Shawn David by submission (Kimura) at 3:51 of R2. -Jonathan Mix defeats John Halverson by TKO (strikes) at 4:25 of R1. -Josh Haynes defeats Sean Salmon by submission (achilles lock) at 2:49 of R2. 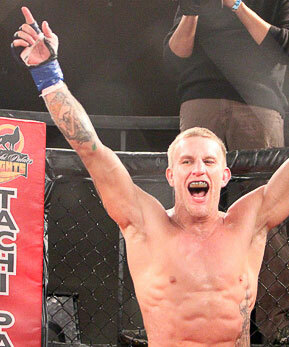 -John Alessio defeats Gideon Ray by TKO (Strikes) at 0:45 of R1. -Mike Pyle defeats Brian Gassaway by submission (Armbar) at 4:21 of R1. -Jay Hieron defeats Chris Kennedy by unanimous decision. -Hector Ramirez defeats Rick Roufus by unanimous decision.